The first time I visited Korea's National Museum, it was in late 1991, halfway during its stay in the former Japanese General Government Building that used to hide Gwanghwamun. Back then, Yongsan Army Base was still a mostly empty space, and the Dragon Hill the highest and ugliest building around. The Yongsan Family Park was yet to be opened (1992), the stalinicoid War Memorial extension to be erected (1994), and the new museum to be inaugurated (2005). What struck me as I first discovered this massive monolith in 2005 was the size and the dullness of the architecture. But the collections were offered a much better display, with a priority on pedagogy and chronology. Not very creative : a little bit like at the Incheon Airport, you know at a glance which gate will lead you to your destination. Pedagogy is one thing, propaganda another. And I don't like the political tone this museum seems to be taking these days. 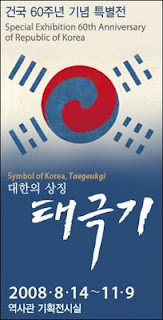 The ROK is celebrating its 60th anniversary and an exhibition on the national flag makes sense. And I was not surprised to notice a dramatic change in the place devoted to the Goguryo era, but what to think of the comments on Dokdo in the new and improved map section ? The other day, at the Tokyo National Museum, I felt the same unease (ie chronologies that could have been written by Shinichi Fujimura), but not at the same scale. I hope that what used to be National Musea won't turn into Nationalist Fora ad nausea.